Non sequitur. Sapir-Hen and Ben-Yosef have been able to establish a strong association between camels and the local copper industry as early as the 11th century BCE. This suggests that the camels were domesticated. In the early period of camel domestication the skeletal remains of domesticated camels would have been almost impossible to distinguish from those of wild specimens. Unless they can establish that these or other earlier sites that would have produced commodities for international trade did not have camels, their conclusion that there were no camels before this date is not supported. No they make the distinction. "The few camel bones found in earlier archaeological layers probably belonged to wild camels... Notably, all the sites active in the 9th century in the Arava Valley had camel bones, but none of the sites that were active earlier contained them." -IOW there were no camels in the levant when the bible says there were. If this were the only mistake found in the bible perhaps we could let god slide. But in addition we find that there were no philistines around when abraham was said to have met them. Nor were there ever any 2M jews in goshen, nor did they ever wander around a thoroughly egyptian-occupied sinai, nor did anyone named joshua ever lead them on a genocidal rampage through a thoroughly egyptian-occupied canaan. Nor did they go on to found great kingdoms ruled by anybody named solomon or david. Archeology tells us these things are lies. And so prudence dictates that biblical historicity be considered false until evidence indicates otherwise. Otto, getting a little carried away with your unfounded assertions aren't you? Archeology does not tell us these things are lies. In many of your citings, archeology is silent. And in at least one, you are wrong. 2008 and later excavations at Khirbet Qeiyafa on the Judah/Philistia border have refuted biblical minimalists such as Israel Finkelstein regarding the time and reality of Davidic Israel. (Yosef Garfinkel, "The Birth and Death of Biblical Minimalism", Biblical Archaeology Review, May/June 2011). 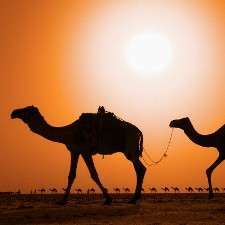 Can you prove that camel domestication is irreversible? -And you continue to tell them. This is a sin, no? 2008 and later excavations at Khirbet Qeiyafa on the Judah/Philistia border have refuted biblical minimalists such as Israel Finkelstein regarding the time and reality of Davidic Israel. "The claim that the larger structure may be ONE OF King David's palaces led to significant media coverage, while skeptics accused the archaeologists of sensationalism. Aren Maeir, an archaeologist at Bar Ilan University, pointed out that existence of King David's monarchy is still unproven and some scholars believe the buildings could be Philistine or Canaanite." -This rich and powerful kingdom is supposed to have stretched from the Mediterranean to the Euphrates and to rival the kingdoms around it. We have plenty of evidence for THEM... but none whatsoever for either David or Solomon. This absence is itself damning evidence, as people have been searching the region for a century and have found ONLY contrary evidence. Actually, I think the article you refer to was from 1999, (Khirbet Qeiyafa findings were 2008 and later). And, Herzog is somewhat notorious for being at odds with other archeologists. -Religionist eureka moments do not qualify as refutation and are easily discounted by objective science. "From such a careless and overblown writer the accusation that minimalists have "groundless arguments masquerading as scientific writing" is pretty laughable. I don't mind him enjoying his private illusion, nor his wishful thinking, and I don't even mind the bitterness of his rhetoric because it is so evidently hollow and from someone unable to distinguish truth from fact and unable to comprehend the position he claims to declare at an end." And, Herzog is somewhat notorious for being at odds with other archeologists. You left out some words. "And, Herzog is somewhat notorious for being at odds with other archeologists whose motivations are primarily religious and political and who BEGIN their research with the understanding that the bible is the utter truth as it IS gods word isn't it?" -Did you know that god thought rabbits have cuds? I wonder where he got THAT idea? "We now know through archaeological research that camels were not domesticated as beasts of burden earlier than the late second millennium and were not widely used in that capacity in the ancient Near East until well after 1000 BCE", p. 37. Perhaps the authors are overreaching. The Bactrian camel is thought to have been domesticated (independently of the dromedary) sometime before 2500 BCE, in Northeast Afghanistan, or southwestern Turkestan. The dromedary camel is believed to have been domesticated between 4000 BCE and 2000 BCE in Arabia. ^ Jump up to: a b "camel", Encyclopædia Britannica. 2007. Encyclopædia Britannica Online. accessed 11 February 2007. Jump up ^ Myths About Camels, The Hatch Report.com. Jump up ^ Al-Swailem, et al. Classification of Saudi Arabian camel (Camelus dromedarius) subtypes based on RAPD technique., Journal of Food, Agriculture and Environment, Vol.5 (1) : 143–148. 2007. Perhaps you are reluctant to admit that the bible is full of nonsense. Which it most obviously is. Your god wrote the bible. He also created the world. Why don't they match? Which are you going to believe - the world, or books full of mistakes, contradictions, adulterations, myths, plagiarisms, graffiti, forgeries, and LIES? Time to accept reality before your superstitions destroy the world and obliterate the evidence. OK Otto, since you want to bring up theology, let me suggest a couple of things. If you care to, try KA Kitchen "On the Reliability of the Old Testament", 2003, $25 at Amazon. Try reading the Bible for yourself – don't take what someone else says as gospel. I like things like Job, Proverbs, Isaiah, John, etc. Do a little thought exercise: Where did all this wisdom come from – 3000 years ago? Take a crack at the old question: "Is there a reason why there is something (space, time, matter, energy, life) instead of nothing?" How did all these things that we can't even comprehend come about? Did they really appear from nothing? Well Ive read it in different versions and I dare say that I know a lot more about it than you because I have not been persuaded to ignore the nasty bits. I also read what it says and not what it is supposed to say. Where did all this wisdom come from – 3000 years ago? What wisdom is that - that the sun orbits the earth? Even greeks back then knew this wasnt true. But the church suppressed this knowledge in favor of geocentrism. Or are you referring to the idea that sickness is caused by evil spirits? Or that the earths rotation could be stopped so that joshua could slaughter the amorites at his leisure? What WISDOM do find in the bible? God was even confused about the order of creation. -And the NIV editors tried to conceal this by changing the tenses. There should be a hell for LIARS like that to burn in. Thats NOT a proper question. If there was or is some deistic creator god then he is most assuredly NOT the theistic god of the bible. Archeology, physics, geology, and bible exegesis have all thoroughly disproved THAT one. If there are gods, only science is capable of finding them. Here is hitchens explaining the difference between theism and deism. You can keep asking your rigged questions generated by your universal answer all you want. But thinking people need not fall for them any more. Yeah this is funny. A story about a poor chap whom god had tortured by proxy just to find out how much he LOVED him. This is somewhat similar, but of a much smaller scale, than the idea that god would remove ALL the evidence for his bible stories and replace it with evidence that those things could not possibly have happened. Your god would torture you and kill your family to find out how much you love him. He would LIE to you to find out how much you TRUST him. He would promise you eternal life in john 3:16 to get you to accept that all unbelievers CANNOT be good, in john 3:18-21. If satan were real (he isnt), instead of appearing as a scary red guy with horns, wouldnt he instead appear as the goodest, kindest, most wonderful guy you could imagine? Wouldnt he promise to grant all your wishes and give you eternal life in return for a few favors now and again? Like - killing apostates, slaughtering tutsi vermin, burning jews in pogrom after pogrom etc. Otto, Hitchens' answers don't matter, yours do. When the chips are down, he won't be there, you will. When He gave us choice, He gave us significance. And He also gave us Himself. Did you miss the whole point of Job and the rest? You religionists thrive on the words of others. You settle for the interpretations of scriptures your preachers give you rather than reading them yourselves with a critical eye. Of course it matters what hitchens and others have said about your religions. They give us the chance of freedom from religious bigotry and oppression. They show us how the books are full of lies which enables us to decide whether those promises we find in them can be trusted. You say that Job is an example of faith. I say it is an example of a beast torturing its prey. How can you possibly put your faith and trust in a god who needs to do those sorts of things to people? Who makes it exceedingly difficult to believe in him, and then sends all who understandably can't, to burn for eternity? No, again, the book says he sent his son to be the subject of human sacrifice. Proxy. An ancient PAGAN ritual, as is the cannibal Eucharist. Otto, Freedom to do it your way is slavery to "doing it your way". Ask any addict, then check out 2 Cor 3:17. Well let's ask god what he thinks about slavery. -What makes you think that 'freedom' can come from a book which contains such depravity? If you don't love your god with heart and soul he will burn you forever. Is this what you call freedom? "When a man sells his daughter as a slave, she will not be freed at the end of six years as the men are." Otto, Mentioning wrong and limiting it is not endorsing it. Maybe you and your mentors just quit reading when you find what you want. Maybe you and your mentors just quit reading when you find what you want. Me ft? Did you know the stuff about slavery and stoning insolent children and wayward women and apostates was in your book? Did it ever come up in church? Who loves to recite john 3:16 which guarantees eternal bliss but leaves out 18-21 which guarantees eternal torture for evil unbelievers? Xians lie to themselves and to each other and to the world. 'God taught us to lie saying...' You can't even post under your primary user name. You're all compulsive, unrepentant, liars. Your book teaches you that any of its commandments can be broken in service to your god, and then explains exactly how to go about doing this. And it guarantees to forgive any sin if you only ask, leaving you and countless priests free to commit the most grievous sins with a clear conscience. Religious books are all evil and the people who believe in them cannot help but commit evil in their name. Otto. You're confusing Christianity with a religion, either the one that Dawkins learned not to offend or the one he advocated (antitheism – reign-of-terror, Stalin, Nazism, Mao, Pol Pot, mass infanticide, etc). Instead of living life as those who see it as a gift do, you've chosen to stay under the bridge annoying them as they pass. So sad.